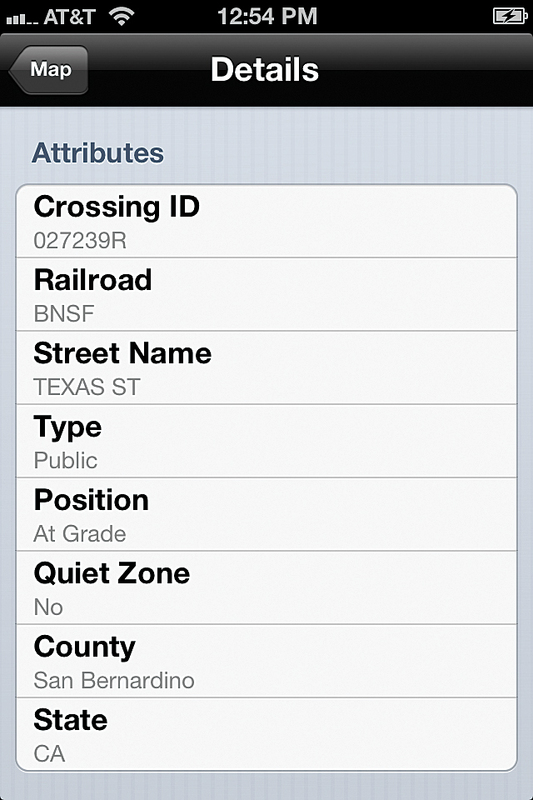 Users can search for rail crossings by ID number or address. The Federal Railroad Administration (FRA) recently released a free mapping app, available from the Apple App Store, that helps improve highway-rail grade crossing safety. The Railroad Crossing Locator provides transportation and safety agencies with a convenient mobile querying tool and the public an interactive channel to learn about the nation’s highway-rail grade crossings. With 140,000 miles of rail network in the United States, freight and passenger railroads intersect US highways and roads more than 212,000 times. These intersections pose potential hazards for pedestrians, rail travelers, and commuters. Built with Esri’s API and SDK for iOS, the app helps locate thousands of rail crossings throughout the United States and displays key safety and descriptive information, including official United States Department of Transportation (USDOT) records. USDOT assigns unique identification numbers, called crossing IDs, to each grade crossing. States or railroad companies that own grade crossings must provide essential physical and operational information about these crossings that goes into a national inventory maintained by the USDOT and available to the general public and safety and emergency response entities. Making federal datasets easily accessed by the public supports key White House transparency initiatives that recommend that agencies find ways to deliver safety data to the public. In 2008, the FRA GIS team launched its first publicly available grade crossing mapping application. Called the Pop-Up Viewer, this simple mapping utility used Esri server technology integrated with a records search tool on the FRA’s safety data website. Although highly successful compared to paper record search methods, the viewer was optimized for web browsers on desktop computers. Typically using a laptop in the field, transportation and safety personnel would have to go through a multistep process to access the location and related records for an individual crossing. Five years later, agencies and the public have come to expect faster and more convenient ways of getting information. In 2012, the FRA decided to modernize the grade crossing mapping application. 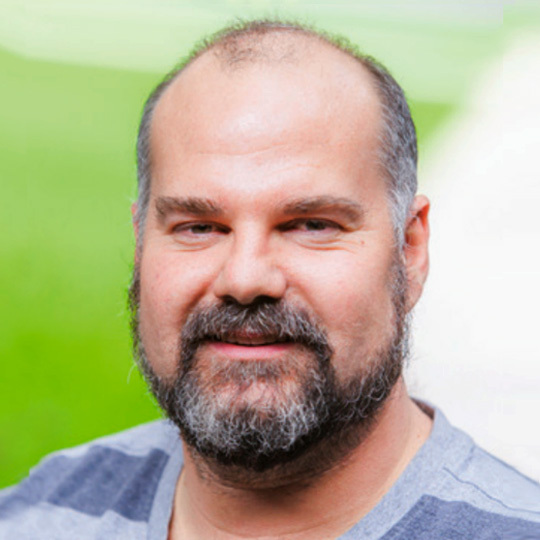 Its GIS team worked with regional safety staff, state department of transportation officials, and others, to determine the core functionality needed to upgrade the application. The consensus was that the mobile application should have an intuitive, simple-to-use interface. Rather than replace the desktop information resource available at FRA’s website, this new tool would complement the FRA’s collection of investigative tools for professionals and the public. The details page gives basic crossing attributes. 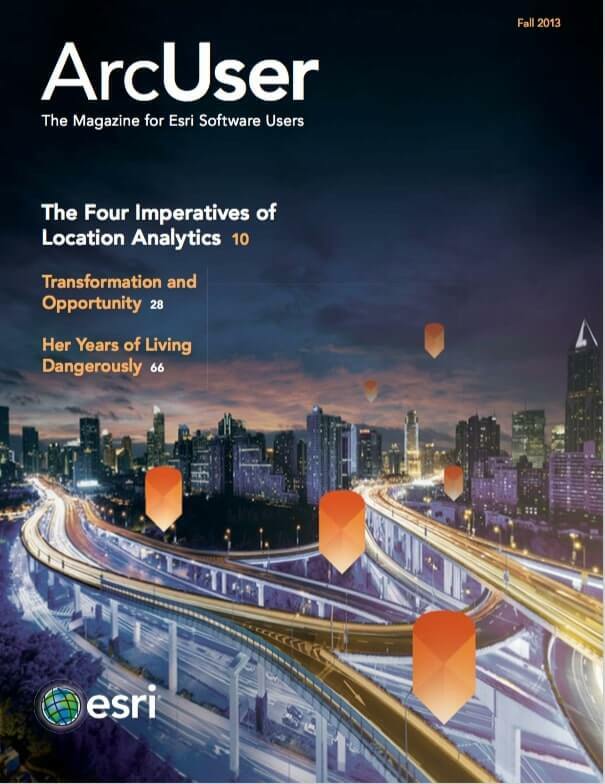 A few years ago, Esri released its iOS API and SDK for creating apps that run on Apple mobile devices. FRA saw that this could provide a better method for getting rail crossing information to relevant personnel and the public. After gathering user input and discussing the project with the IT and Public Affairs office, the GIS team came up with interface and functionality requirements and decided to work with Esri Professional Services to build the Rail Crossing Locator, a native iOS app. This app consumes FRA’s ArcGIS for Server map services, allowing users to perform queries on the FRA Grade Crossings spatial database. That database contains an inventory of all highway-rail crossings with accurate spatial locations throughout the United States and information about the crossing owners; crossing locations; and the highway, traffic control, and physical characteristics of the crossing. The app also allows users to access official USDOT Inventory Record and Accident/Incident records for each crossing. The app initially pinpoints the user’s location and shows nearby crossings. The aerial basemap is the default, but three other basemaps are available. The crossings symbols are color coded to denote whether the intersection is at grade, above grade, or below grade. Selecting the crossing displays a pop-up with the crossing ID number and address of the intersection and provides access to an additional page that shows a selection of the main attributes (e.g., operating railroad, road name, county) and links to the crossing’s official USDOT Inventory Record and Incident Report. A convenient reporting option allows the user to send an e-mail to the FRA regarding a nonemergency issue at a specific crossing, which is automatically populated with the specific crossing ID. Besides finding crossings near their location, users can search for crossings by unique USDOT crossing ID or street address. Using the embedded filter tool, users can also find grade crossings by selected characteristics. 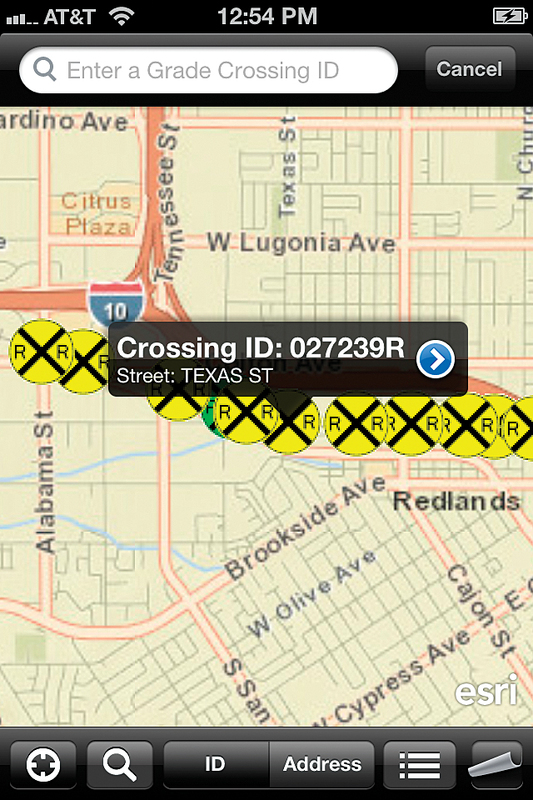 The Railroad Crossing Locator app gives easy access to information that improves investigative and reporting processes. Citizens can also use the tool to modify travel plans to avoid potential delays at crossings and be more informed about safety issues.